It’s important to raise the visibility of your Twitter handle to increase your followers, which could then give you insights about who you should follow. One of the simplest ways to raise your Twitter visibility is to place links to your handle in your LinkedIn profile. This is rarely done, but quite easy to do. Does your team want to learn the tips-and-tricks about using Twitter as an AR tool? Sign up for the AR Team Briefing: Social Media – Twitter 101 to become Twitter ninjas. Bottom Line: Taking simple steps to increase the visibility of your various social media persona is easy. Question: Have you taken a holistic approach to your social media profile? In this SageCircle AR Workshop, we provide AR professionals with information, tools and insights to make sense of the fast evolving social media scene. The goal is to help you get up-to-speed on the implications of social media for AR so that you can make the important decision whether and how to add social media to your mix of interactions. The next session of the “Launching an AR Social Media Strategy” Workshop will be held on Wednesday, June 17th from 1 pm to 5 pm US Pacific Time in the Silicon Valley. The cost is only $495. Click here to learn more about the workshop and register. 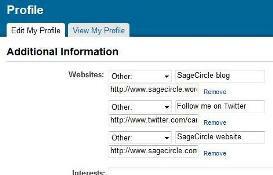 You can also contact us at 503-636-1500 or “info [at] sagecircle dot com” to talk with us about the workshop and the full range of SageCircle social media offerings.